hardbone manages to link everything together: Even exploring this madman's nightmare tells me that the socialist from NASA have gone over the bend into madness. First where is that ignoramus Gore and second did trying to integrate the Islamo Fascist into NASA fail? This is scarier then sh*t.
Tamino challenges Roy Spencer to rule out leprechauns as the cause of most of the recent warming in the thermometer record. Doesn't he realize you can't prove a negative? Besides the most absurd thing about his post is that he even for a second entertains the preposterous idea that Leprechauns could have had a warming influence on climate. Everyone knows Leprechauns have had a cooling effect on climate in the last 60 years. 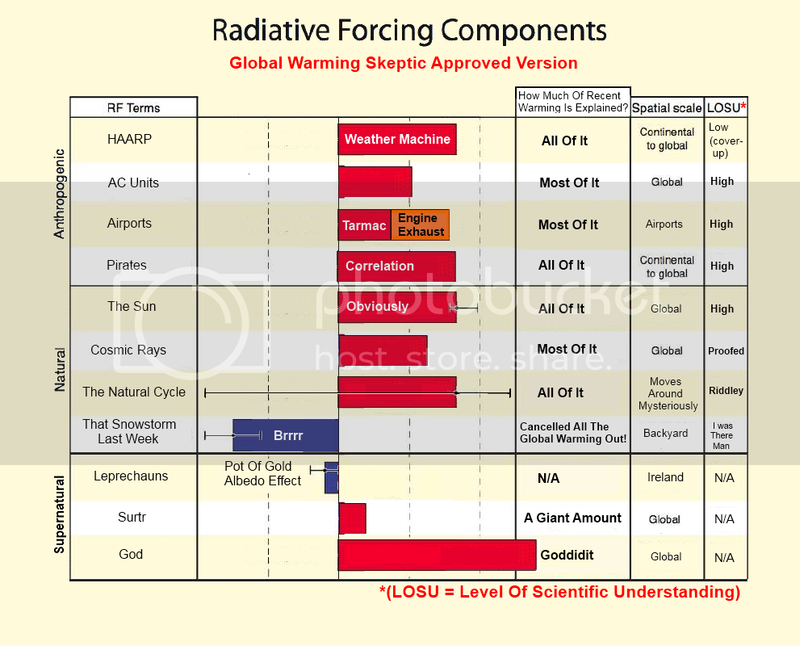 In fact Leprechauns are the only cooling supernatural radiative forcing known to blog science. How Do Leprechauns Influence Climate? As far as modern science can ascertain, Leprechauns influence climate by modulating the effects of Galactic Cosmic Rays (GCRs). It seems that an increase in GCRs prompts an increase in clouds. In turn this leads to more rainbows, each of which according to legend prompts a Leprechaun to place an extra pot of gold at it's end. The albedo increase due to all these new shiny pots of gold being left around induces a small cooling effect on the planet.